The availability of grant aid has allowed many owners to enhance the condition of there properties in the City of Inverness. 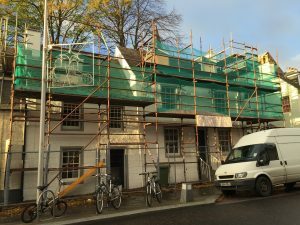 We managed works to two properties; Balnain House and 109/111 Church Street, Inverness. 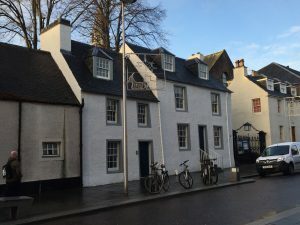 Balnain House, a 18th century property on the banks of the River Ness, benefitted from a package of external repairs including a new lead roof, repairs to traditional sash and case windows and lime treatments to the external walls. The works gain Historic Scotland grant support. 109/111 Church Street, next to the Old High Church gates, had works to repair roofing, windows, masonry chimney stacks and a full decoration in a restored traditional colour scheme. The works were supported by an Inverness City Heritage Trust grant. 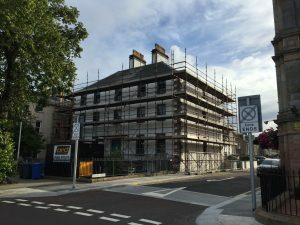 We hope these projects will encourage others to enhance the condition of traditional buildings in Inverness city centre. The potential to access grants and advice to undertake informed and sensitive repairs is an opportunity not to be missed.